Award-winning Food Sleuth Radio ranks among the top national “green food radio shows.” If you care about what you eat, tune in! 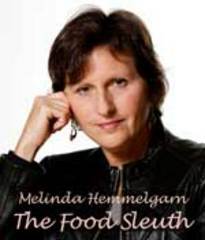 Melinda Hemmelgarn is a registered dietitian, “investigative nutritionist,” award-winning writer and Food Sleuth Radio host. With 30 years’ experience in clinical, academic and public health nutrition, she’s a trusted consumer advocate, and an engaging and energizing national speaker. For 20 years, Melinda wrote a weekly, trademarked Food Sleuth newspaper column for the Columbia (MO) Daily Tribune. She has published articles in the American Journal of Nursing, Today's Dietitian, Natural Awakenings, ACRES, Current Health, and Edible Communities magazines. Prior to her freelance writing, speaking and radio career, Melinda developed and directed the Nutrition Communications Center at the University of Missouri. In 2004, she received a Food and Society Policy Fellowship which allowed her to connect the dots between food, health and agriculture. Today she uniquely applies critical thinking skills to media messages about food and farm policy to advance "food system literacy." Melinda received her B.S. in Dietetics from Florida State University; her M.S. in Human Nutrition and Food Systems from the University of Missouri-Columbia, and completed a dietetic internship through Cornell University at the New York Hospital. She is a member of the Association of Health Care Journalists, National Association for Media Literacy Education, and the American Dietetic Association’s Hunger and Environmental Nutrition Practice Group. Food Sleuth Radio has been produced by Dan Hemmelgarn at KOPN Studios in Columbia, MO since June, 2009. The “Mother Nature Network” ranked the show among the “top national green food radio shows” in 2009, and in 2011, Food Sleuth Radio won 1st place for radio interview from the National Federation of Press Women.